When the Northern Kings heard of the complete destruction of the Southern kingdoms, they joined forces against the Israelites and met at the Waters of Merom to fight against Israel. They were as numerous as the sands on the seashore. They also had a large number of horses and chariots. Again, God encourages Joshua and tells him not to be afraid for He will deliver them, slain, into his hands. God tells the Israelites to hamstring their horses and burn their chariots. So the Israelites attack this huge army and defeated them. They chased them and slain all of them and hobbled their horses as the Lord directed. Joshua returned to the city of Hazor and slaughtered everyone there as their king was the instigator of this attack upon Israel. He then totally destroyed all of the cities and kings that came against him as Moses had commanded. They did not burn any of the cities on their mounds. However, Joshua did all that Moses directed and killed everyone. All the plunder and livestock the Israelites kept for themselves. 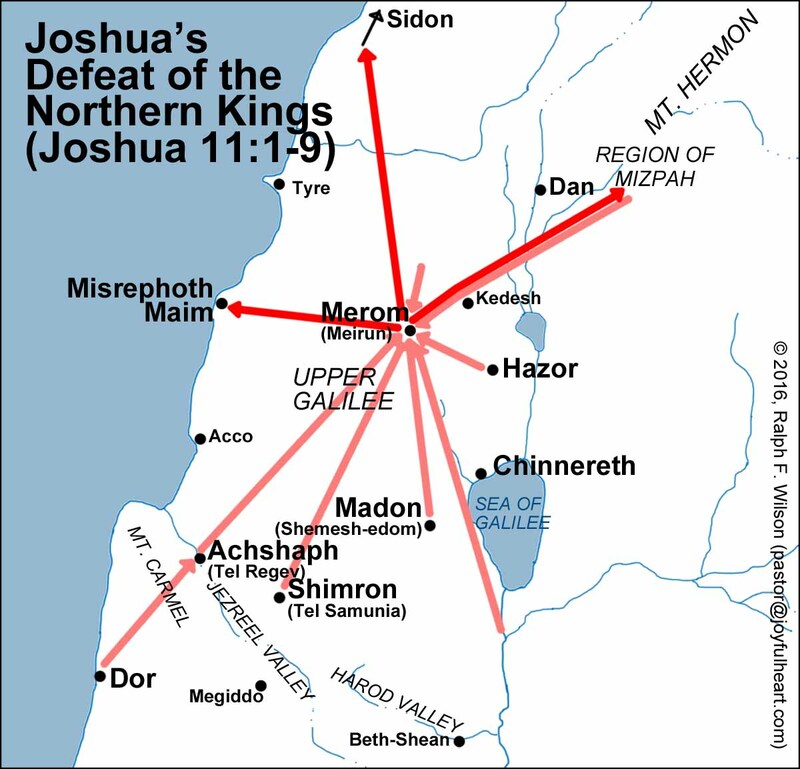 Joshua continued the conquest of the Promised Land, taking the entire hill region, the Negev, Goshen, and more. All the kings and peoples were attacked and killed except for those living in Gibeon. The Lord had hardened their hearts to wage war against Israel so that they may face punishment. Joshua took the entire land the Lord had promised, divided it up according to tribes, and rested from war. 9) “Do not be afraid of them” and “hamstring their horses and burn their chariots.” Joshua needed encouragement and direction from God (as we all do). The enemies were more advanced than the Israelites in terms of warfare since they had horses and chariots. So to ensure they wouldn’t fight them again, the horses were hobbled and chariots destroyed. God keeps His word and directs the Israelites exactly as needed. 10) The Anakalites were the reason the Israelites hadn’t entered the Promised Land sooner and were relegated to wandering the desert for 40 years. The Hebrews thought them to be descendants of the Nephilim, a powerful race who dominated the pre-Flood world (Genesis 6:4; Numbers 13:33). When the twelve Israelite spies returned from exploring the Promised Land, they gave a frightening report of “people great and tall” whom they identified as the sons of Anak (Deuteronomy 9:2). The Israelites had finally conquered them. 11) Personal Question. My answer: None really. We all deserve death, and it’s only by God’s grace that we are still breathing today and saved by His Son, Jesus Christ. This is an evil world full of evil, violent people. God uses the sin that entered through Adam to punish His enemies. That is His prerogative, and we are to accept it without question. Furthermore, God has a reason for everything He does that is beyond our understanding. I love how God is always encouraging and always instructing His people. I love how even the impossible (the defeat of the Anakites) is possible through Him. The Israelites are now the target due to their success. The same applies to our success on this side of heaven. There’s always someone jealous of you who’s looking to take you down. The challenges facing the Israelites are increasing with a gigantic foe and superior weaponry. Same for us: we often find that the challenges facing us in our Christian life increase at each step. God uses each previous victory as a springboard for what we face in the future. Fear was an issue for Joshua and the Israelites; hence, God’s encouragement. Again, we see Joshua’s military boldness as he initiates the attack once again. I’m sure an army that size would expect the Israelites to high-tail it out of there, not attack. What is Hamstringing and Why did God tell the Israelites to use It? Hamstringing is just what it sounds like: cutting the hamstring muscle in the leg, hindering proper movement and effectively hobbling the animal. This was common on animals and on humans in ancient times. It was also extremely painful. Hamstringing rendered the animals useless, so they couldn’t come against the Israelites again. Horses and chariots were an advanced weapons of war that the Israelites would not master for hundreds of years. It was far easier to effectively erase the threat than learn how to use the threat. This showed complete trust and faith in God as the Israelites did what God told them to do, and didn’t try to use the enemies’ tools for themselves. What do we learn from the complete annihilation of the Enemy? Israelites had complete faith and obedience in God. Canaanites were completely and totally unable to be redeemed and thus deserving of just punishment. What is the “hardening of the hearts”? The hardening of men’s hearts is when God gives man up to the sin that is in his heart (Romans 1:24-28). There was no grace shown to the Canaanites. The last tribe to be defeated by the Israelites, the Anakites had prevented Israel from entering the Promised Land 40 years prior. They fall easily. God saves them for last as the Israelites needed supreme confidence to defeat them. What do we Learn from the Anakites? God knows how to manage the battles in our life. Total surrender to God’s will is our response. Sometimes we have to fight last what we think is first. The giant Goliath is an Anakite from the descendants of the Nephilim. Goliath comes from the city of Gath some five hundred years later (1 Samuel 17:4). Judges 1 summarizes the incidents recorded in Joshua, but from a different point of view. Joshua presents the campaign as highly successful; Judges shows that many military goals were never achieved. One possible explanation: Joshua presented the wars as a series of raids on territory and did not include the “mopping up” and settlement process. Judges shows that, after the Israelites divided up the land, they proved fall less successful in the second phase of conquest. This ends section 1 of the Book of Joshua as mission has been accomplished with the defeat and occupation of the Promised Land. Obviously, not every town and city had been conquered. That was left up to the individual tribes to accomplish within their individual territories. Same with Jesus: he defeated the enemy, but we still must claim what is ours. No day 5 lesson 3?